College is an exciting time for most students as they embrace learning and growing in a new community. Along the way, however, life can throw a wrench into the best-laid plans. Harsh circumstances can certainly crush a young person, or they can offer a chance to develop a sense of self and strengthen one’s determination to overcome and even thrive. Two FIU students each battled profound personal difficulties and have shared their stories of trials and triumph. Not only did they find their way back from despair, they turned their own experiences into opportunities to help others. 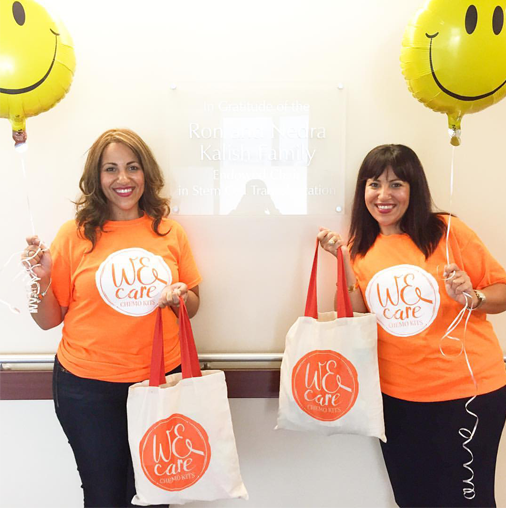 Embracing life: Gisenia Reyes, left, with twin sister Lucy Reyes, founded the We Care Chemo Kits as a way to boost the spirits of cancer patients undergoing chemotherapy. Having experienced the process herself, Gisenia—here donning a blonde wig and an indefatigable attitude—well understands the plight of those facing the disease. We Care Chemo Kits provides pediatric and adult cancer patients with a kit filled with useful items to ease the chemotherapy treatment process. The items are found at the dollar store and are donated by the community. The chemo kit includes items such as coloring books, word searches, handheld games and arts and crafts to name a few. Each delivery includes a colorful foil balloon and a heartfelt get well card written by a child. “I spent over 100 days collectively in the hospital, so I understand firsthand what a chemo kit like this does for a cancer patient. It gives us joy, faith and endurance to keep fighting knowing that there is hope on the other side,” she said. As her initiative has expanded, so has the outpouring of support. One woman sent handmade hats to help patients cope with hair loss and another had her child’s entire martial arts academy send in handmade get well cards to include the chemo kits. “There are many creative ways to get involved with the organization. You can volunteer your time, your talent, donate the items, make a monetary gift donation, create your own fundraiser, send in ideas. The options are endless,” she said. The Center for Leadership and Service at FIU, which recognizes and supports student-led initiatives, provided the Reyes sisters with a $1,000 grant to purchase startup items. Reyes emphasizes an important aspect of the program is the delivery of the kits by cancer survivors. “I want each patient to see hope face-to-face,” she said. She also wants to create a network of survivors to come together to exchange coping tips and celebrate life after cancer. But, she says, the struggle is worth it when she sees a smile on a cancer patient’s face. To date, some 150 patients in the local community have received the kits, and Reyes plans to expand to Broward and eventually nationwide. In the meantime, the English major has plans to reenroll at FIU in the spring and, fittingly, is working on a book documenting her experience as a survivor. Emerging from her shell: Kelly Nair Rojas clawed her way back from a suicide attempt to find her self-worth in helping others and pursuing a path of study and research in the field of biomedical engineering. Kelly Rojas, 20, feels alive when she helps others. 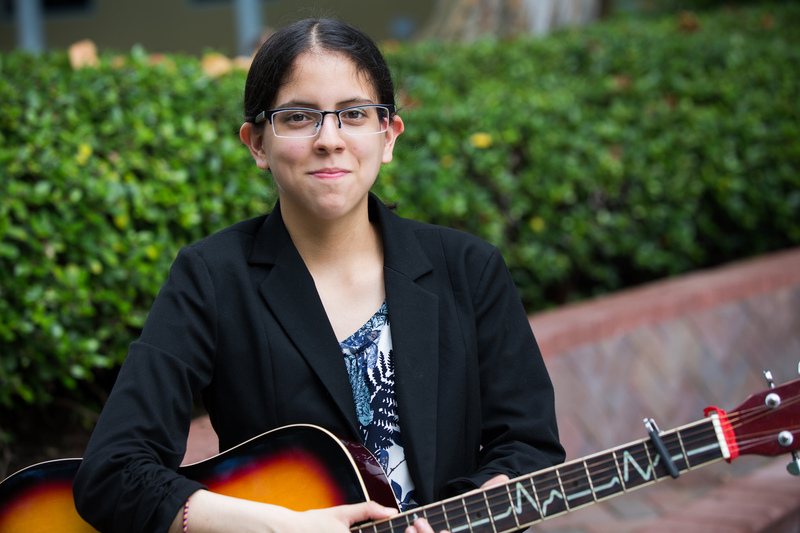 The junior biomedical engineering major joins fellow FIU students in a campus organization that offers musical instruction to groups of individuals with neurological disabilities such as dementia. Herself a guitarist and pianist, she teaches them how to hold and play simple instruments such as tambourines and maracas. The experience provides an outlet for interacting with others to a population for whom social activity is often limited. Rojas takes away lessons that she hopes to one day apply to her professional career. “I want to help individuals with disabilities through research and nonprofit work,” she said. And she is well on her way. Working on research with Professor Jacob McPherson to learn about the relationship between pain and motor control in stroke victims, Rojas has dreams of going to graduate school and, one day, opening a therapy center that will help people with a variety of disabilities. Rojas’ own challenging journey, though of a very different nature, began years ago in her native Venezuela, where her parents earned a comfortable livelihood as jewelers. Their success, unfortunately, caught the attention of criminals at a time when many with money were abducted for ransom. When her father disappeared one day, the family handed over a large sum for his return. Within a year her father was kidnapped yet again, and the harrowing experience this time drove the Rojases to relocate to Miami in 2009. In hopes of starting anew, her parents purchased a dry cleaning business, but the global financial crisis eventually forced the company under as it did so many others. The strain contributed to her parents’ divorce, and her father returned alone to South America. Fending for themselves, Rojas and her mother for a year shared a bed in a storage unit, a far cry from the big house in which they had all once lived together in Venezuela. Rojas didn’t let her school friends know of the family upheaval, which was exacerbated by her personal battle to accept her sexual orientation. Gays and lesbians are not widely accepted in her native Venezuela, and she felt that coming out would simply place another burden on her mother. At her lowest point, Rojas attempted suicide. “I struggled to see a future,” she said, “and I thought I could end everything.” Only by recognizing the sacrifices her mother had made on her behalf did Rojas find it within herself to finally decide to go on. Rojas eventually received counseling and was diagnosed with post-traumatic stress disorder as a result of the tumult she had faced at such a young age. Then in her junior year of high school, she learned of an organization that would have an important positive impact on her. The Best Buddies Club set her up to begin working with individuals with disabilities. The experience of helping others motivated her to try harder in school. She raised her GPA by nearly a whole point during her senior year and earned admission to FIU. There she continued to keep up her grades and earned a McNair research scholarship, a prestigious award that connected her with a mentor and set her on a path to graduate school. Her classroom success led to her tutoring other students, and she went on to on volunteer work with the YES Institute, a nonprofit organization dedicated to preventing youth suicide. Rojas has no doubt that connecting with others has helped her find her true calling in life.